2016 MJEA Friend of Scholastic Journalism – Missouri JEA. 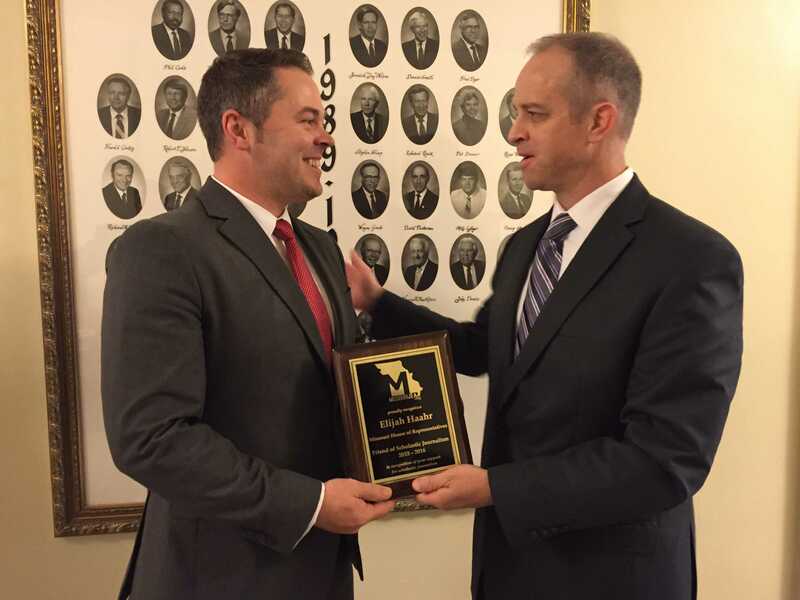 Missouri Representative Elijah Haahr receives the Friend of Scholastic Journalism Award from MJEA President Mitch Eden April 13 in Jefferson City. Rep. Elijah Haahr has been named the 2015-2016 Missouri Journalism Education Association’s Friend of Scholastic Journalism winner. This award is given to a professional journalist, professional media outlet or other individual or group making a significant contribution to scholastic journalism. Earlier this year, Rep. Haahr introduction the Walter Cronkite New Voices Act, which seeks to provide Missouri’s student journalists with the same freedoms as professional journalists. So far, the bill has made it out of the Emerging Issues Committee and the Rules Committee, and will likely head to the floor of the House in mid-March. Rep. Haahr, a Republican, represents south central Springfield (District 134) in the Missouri House of Representatives. He was elected to his first term in November of 2012. In addition to his legislative duties, he is an attorney with Aaron Sachs and Associates and focuses his practice on workers’ compensation and civil litigation. He is licensed to practice in Missouri and Oklahoma.